The spirit of a luxury house is often represented by the personality and the charisma of its leader. Louis Moinet’s CEO Jean-Marie Schaller translates this idea. 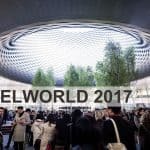 LuxuryActivist had the opportunity and privilege to meet Mr Schaller in the heart of Baselworld effervescence. We wanted to know more about him and this magnificent watch brand. LuxuryActivist (LA): How did you get to Watchmaking? Jean-Marie Schaller (JMS): Did you read Asterix? It’s like Obelix, “I fell into the pot when I was young”. I come from the Jura region. My family is very catholic and I used to go to church. As a child I also used to watch all those people working in watchmaking workshops. There were not many brands in the Jura but there were many factories of watch cases, dials, etc… I used t0 watch those people getting out of those workshops with the same look as when we go to church. A look of dignity when we placed all our soul into something. I have a commercial background but watchmaking for me is about heritage, when we place all our guts and soul into it. 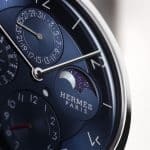 LA: With a remarkable career in companies like Siber Hegner, Perrelet or even Lacoste, how did you get the idea to revive the Maison Louis Moinet? JMS: It was something that pursued me. I do not know if you believe in destiny, sometimes I do and sometimes i don’t but in this case I think it was my destiny to do it. When I was working for Siber Hegner I had the chance to launch Daniel Roth who was completely unknown at that time – 1991. When the Chaumet brothers had Breguet (end of the 70s), they mandated François Baudet to relaunch Breguet from almost nothing. He hired a watchmaker for the mission who was Daniel Roth. 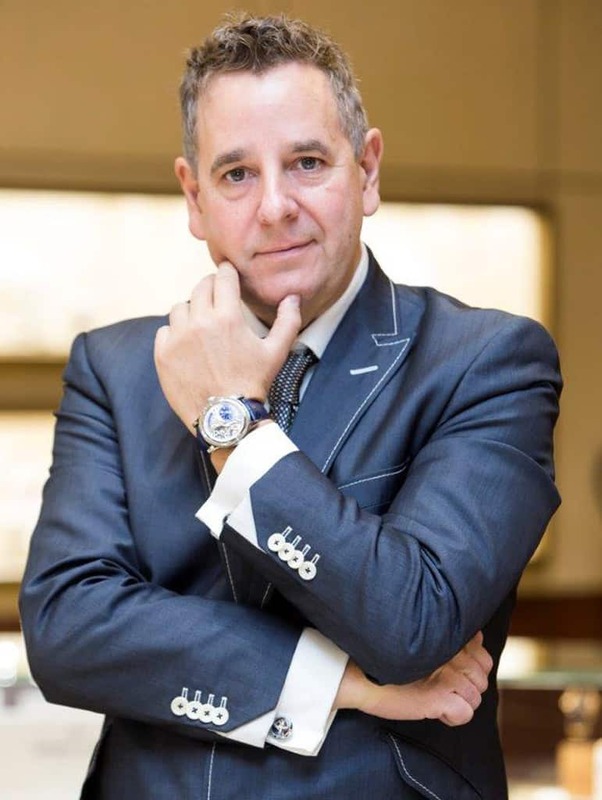 To reestablish Breguet, Daniel Roth studied all the brand archives and it was at this time that he understood the importance of Louis Moinet in the history of watchmaking. Louis Moinet was a very interesting person because he was a gifted artist and a good technician. Hew was as well very modest as his only interest was to make progress in his art. So Daniel Roth was the first person who talked to me about Louis Moinet. He told me that Louis Moinet was a perfect brand for me. He knew I wanted to have my brand one day. He said I needed to take over Louis Moinet. I did not do anything at that time. Then in the second half of the 90’s, I was given Marketing classes when I launched Perrelet. One of my students was like my younger brother, so he followed my advice to trademark a historical brand and he registered Louis Moinet. After a little while I ended up buying the brand and since then the story restarted. To make a long story short: it was my destiny. LA: Last year justice was done with the official accreditation by the Guinness for the paternity of the Chronograph invention. How did the process happen? JMS: It required a lot of proof and a lot of time. When we acquired this piece (talking about the first chronograph by Moinet) we knew it was the first chronograph but we did not announce straight away. It took us 9 month before talking to the press about it. During this time we have established an unequivocal file about it. Imagine a small independent watchmaker claiming such paternity we would expect that many people would challenge that. 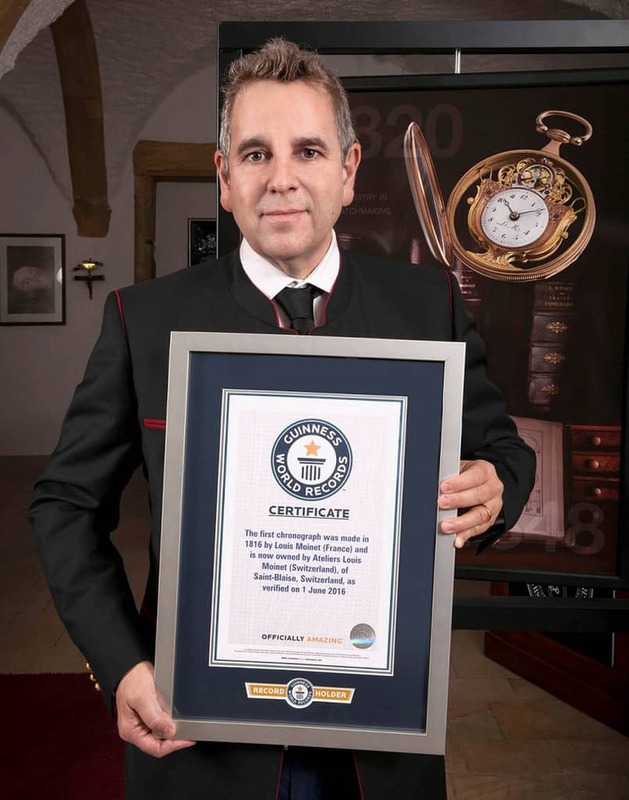 To accomplish this, we used all the archives we had about Louis Moinet and especially 30 letters we bought for CHF 80’000 that were written in the years 1920’s. Those letters were useless until this point when this Compteur de Tierces was sold. Thanks to the letters we knew it was dated around 1815 to 1816 because Louis Moinet talks about it twice. That was a first proof. The second proof was the fact that this piece was done in Paris and that it is made of Silver and there is a watch hallmark. At that time hallmarks were very regulated and thanks to it we could identify the period: 1815 to 1819. This was before Nicolas Mathieu Rieussec who developed the first marketed chronograph at the behest of King Louis XVIII in 1821. After this, we mandated a specialized watchmaker to dismantle the piece and analyse it. Obviously after the press conference and the announcement there are always people to challenge this claiming but we had all the proves. Having this Guiness certification is a fantastic thing. It is the credibility of the case that is stated thanks to the Guinness. 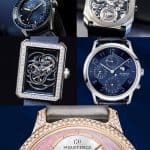 LA: What makes the particularity of Louis Moinet compared to competing watchmakers? What elements make the uniqueness of a Louis Moinet watch? JMS: We do not create a watch for a marketing reason. As explained, I have the love for watchmaking and this is all that counts. We do not have a business plan, everything is in my mind. It is the heart who rules. We are a small independent brand with a big name to manage. 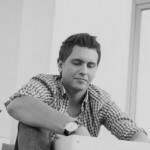 Let’s consider a few customers only: if everything is fine for them or not it makes a CHF 5 million turnover difference. For us this difference is huge. That is why I do not want to establish annual objectives and then struggle to get there. We have small means, we work without any banks, we make our living from our sales. In this context we are true creators. It is our mission to surprise the public, like entertainers. we always need to find something that put a smile on their faces, that seduce them. This is the mission of the creator-watchmaker. Then the mission of the “farmer” is to make sure at the end of the year there is money in the account. This is my “marketing strategy”. LA: How would you describe the Louis Moinet client? JMS: They are loyal customers who generally have ten of our watches already. We got a great success in the Middle-east with the Royal families. There are markets like Oman in which Louis Moinet is a name of reference because her majesty bought several hundreds of our watches. They represent gifts to important people. So our company name is present at a high level. Then there are what I call the “new collectors”. People who like to wear their watches. They are in Russia, Portugal, Brazil, Middle-East or the US. We started several years ago a strong work in Asia and very recently we got the first results. In all cases they are customers who like to have beautiful watches, something different. They come to Louis Moinet and ask: “what is new? What would you have that would surprise me?”. LA: The Swiss Watch Industry had a more than a complex year in 2016. How did it went for Louis Moinet? JMS: It was a very stable year. Same sales, same volume of pieces produced in comparison to 2015. We used to stop our financial year in June but last year we decided to stop it in December in order to be in a more calendar year. LA: What are the specific qualities required to run a watch brand in difficult times? JMS: I do not know if this question is for me. You should ask this question to CEO’s of bigger brands. At Louis Moinet we are an “Atelier”. For a small company as ours the most important thing is to keep the enthusiasm, to always keep the aim for innovation and find the means to succeed doing it as it can easily be a lot of money. It is like having a six bullet barrel and you have 6 enemies in front of you. You bet not fail one single shot. LA: How do you see the watch industry evolving in the coming years? What do you think is the case for Swiss watchmaking to differ? 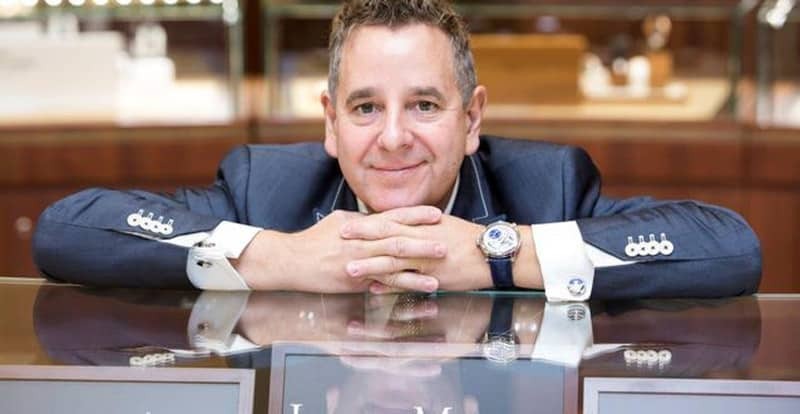 JMS: I think the big Swiss Watch brands should cultivate the love for watchmaking. For a person like me who loves beautiful watches, I am often surprised to see I do not find anything worth it when I pass by a watch shop window. Some companies remain in a certain complacency. Sometimes what we see in certain brands is too commercial. It is like a Formula 1 race. We expect to see colors, noise, suspense… This is what we should find as well in watchmaking. 20 years ago, watchmaking was much more fun than today. Currently a lot of creations are standardized. I would love to see more daring. I lot of people are afraid of risking something. One example: The chronometry contest. Louis Moinet won the contest with our Tourbillon. It is a fantastic thing. We could assume we have the best tourbillon of the world. But if you are critical, you could ask me who were the other participants? There were 7 or 8 tourbillons of independent watchmakers and Chopard as well. The big brands does not participate to the chronometry contest. Why? It should be the most beautiful contest of the year. It was the case in the 70’s. Big brands are afraid of loosing and being exposed to critics. It is an example that reflects the current attitude. LA: Last question, What can we wish you for this 2017 Baselworld? JMS: Success! To being able to share this happiness of making beautiful watches to the higher possible number of people. JMS: And what can we wish you in return? LA: To make such beautiful encounters as this one every time! In Swiss watchmaking, creativity seems endless. With passion, courage and innovation, Swiss watch brands have a bright future, no matter economics or geo-politics. Single-hand watches, less is more.